Jeb Bush Stands Firm On Common Core But Softens Tone : It's All Politics Other potential GOP candidates side with Tea Party-backed opposition to the education standards, but the former Florida governor is not backing away from his longstanding support. Former Florida Gov. 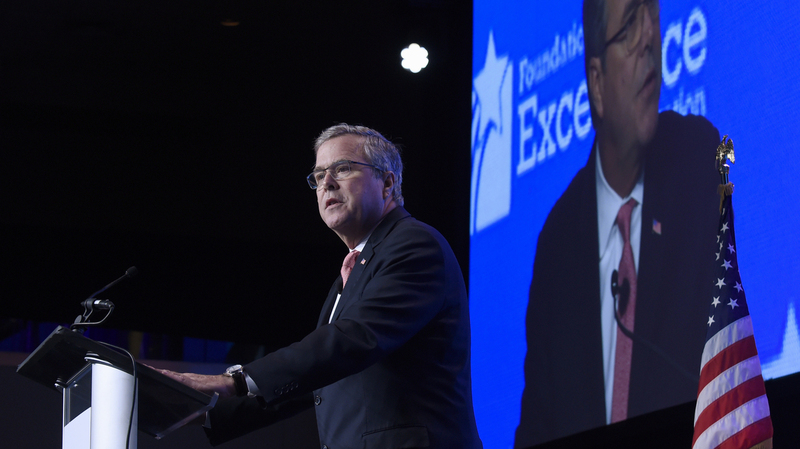 Jeb Bush addresses an education conference Thursday sponsored by the Foundation for Excellence in Education, a nonprofit he created as he left office. Former Florida GOP Gov. Jeb Bush defended the Common Core education standards Thursday, but offered an olive branch to Republican activists who oppose them and are making them a litmus test for potential 2016 presidential candidates. Bush's longtime support has put him crosswise with part of the Republican base. He said that he finds the new angst over Common Core "troubling," but that there is room for disagreement among those who more generally support school reform. "Look, even if we don't all agree on Common Core, there are many principles for us to agree on," he said. "Education should be a national priority, not turned into a federal program." Bush spoke to nearly 1,000 state legislators, teachers, school administrators, and advocates of charter schools and private school vouchers at the Marriott Wardman Park Hotel in Washington, D.C. It was a friendly audience attending the seventh National Summit on Education Reform sponsored by Bush's Foundation for Excellence in Education, a nonprofit he has used to continue pushing the policies he championed as governor. He was introduced by a recent college graduate from Jacksonville, Fla., who earned her high school diploma from a Christian school using a voucher. She said the experience let her escape poverty and a family history of dropping out of high school. "Thank you, Gov. Bush," said Denisha Merriweather. "Without him, I don't know where I would be today." Bush left office in January 2007, before the Common Core standards were adopted by the National Governors Association and school administrators from around the country. But he has consistently and forcefully advocated them as a way both to improve performance in public schools and to justify private school vouchers for students in schools that continue to do poorly. Bush has also blamed Common Core's growing unpopularity among the Republican base on the Obama administration's embrace of the standards, including their linkage to the Race to the Top grants early in President Obama's first term. Other likely Republican 2016 candidates, though, have joined the chorus of opposition. Louisiana Gov. Bobby Jindal was once a supporter but now is a vocal critic. And Kentucky Sen. Rand Paul has flatly warned his rivals that a Common Core supporter cannot win the Republican nomination. On Thursday, Bush did not back away from those standards but did say he doesn't mistrust the goals of opponents. "I respect those who have weighed in on all sides of this issue. Nobody in this debate has a bad motive," he said, but then added that states that do abandon Common Core must adopt tough standards of their own. "In my view, the rigor of the Common Core State Standards must be the new minimum in classrooms," he said. "And so for those states that are choosing a path other than Common Core, I say this: That's fine. Except you should be aiming even higher and be bolder and raise standards and ask more of our students and the system." Earlier this spring, he told Fox News that he didn't understand why one-time supporters of Common Core were changing course. "I just don't feel compelled to run for cover when I think this is the right thing to do for our country. And others have — others that supported the standard all of a sudden now are opposed to it. I don't get it," he said in April. Bush introduced high-stakes standardized tests, school grading and statewide private school voucher programs during his two terms as governor. He has continued advocating those ideas around the country since he left office nearly eight years ago. Bush has said he is considering a presidential run for 2016, and that he plans to decide by the end of this year.